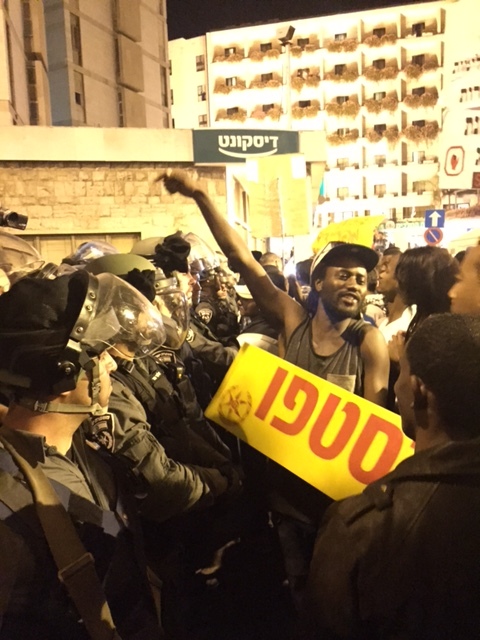 On April 30th a massive anti-racism demonstration brought parts of Jerusalem to a halt. 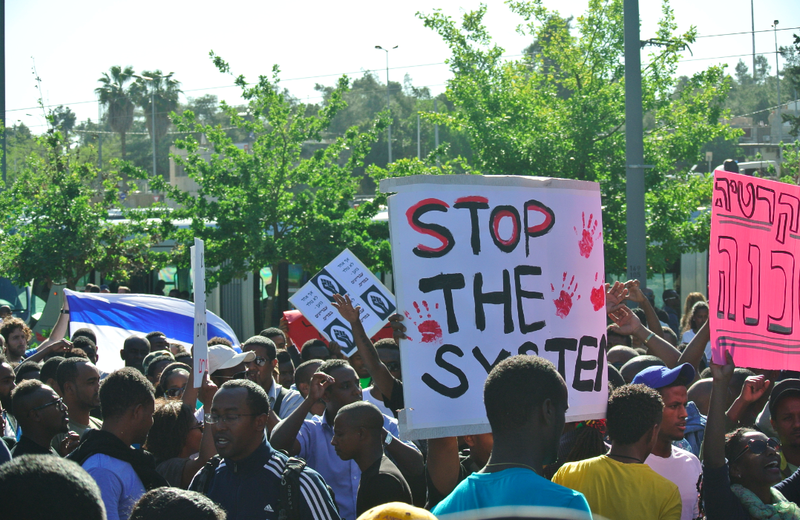 More than 1,000, mostly Ethiopian Jewish, protesters gathered on Route One and later outside the Prime Minister’s house. 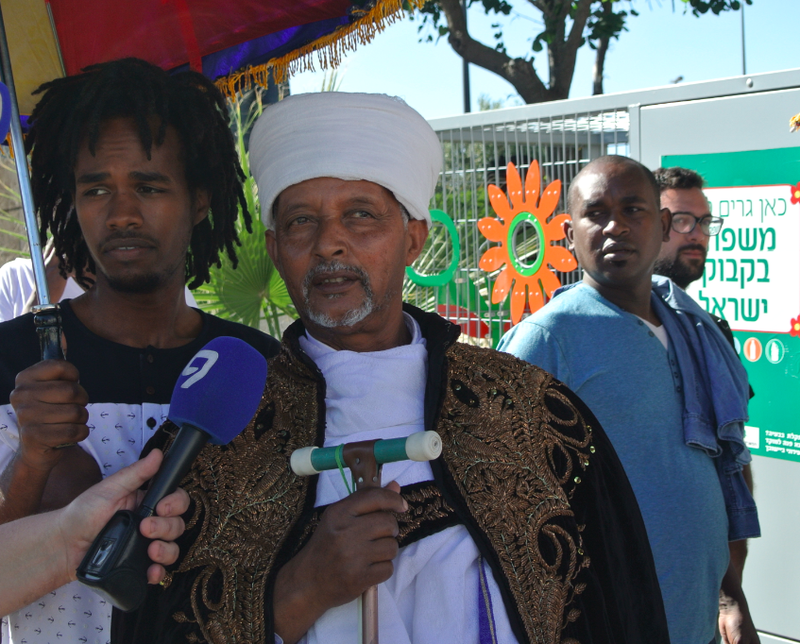 The protest highlighted years of ill-treatment of the community, including high incarceration rates for Ethiopians serving in the IDF, and an increase in police violence in the often poverty-stricken towns where Ethiopians are concentrated. 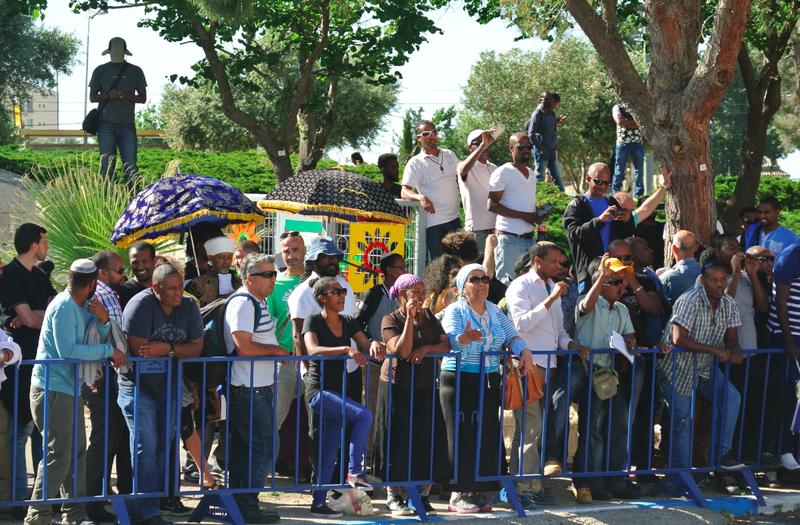 The protest also highlighted the divisions in Israeli society, as few non-Ethiopians joined the events, and as even the Prime Minister made a gaffe calling them “immigrants”, when they are native-born Israelis mostly. Where were the “left” wing anti-racism groups wondered some. Where are the Knesset members asked Pnina Tamano-Shata, the former MK from Yesh Atid. The event was triggered by a film earlier this week that showed two policemen in Holon assaulting an Ethiopian IDF soldier in an apparently unprovoked attack. The Israeli police condemned the assault when the video emerged and suspended the officer pending an investigation. But the video comes on the heels of other reported beatings of Ethiopians, and a feeling that violence is being meted out to the community by authorities. Facebook was abuzz during the week about confronting the violence and a campaign called “struggle against police violence” announced a protest at four in the afternoon. Earlier in the day a group of community activists had met with senior police officers to discuss the problem. The “urgent meeting…to root out the problem and the police officers who transgressed agreed to establish a committee to investigate,” according to a Facebook post by community activist Yissachar Mekonnen, leader of an NGO that works with the Israeli army to improve Ethiopian army service. Israel President Reuven Rivlin also met with 85 Ethiopian youth and said he expressed shock at the video images. He vowed that society should d more for the community. However Ethiopian activists were not happy with these meetings. They felt that the Police Commissioner Yohanan Danino was trying to sweep this under the rug by claiming to “investigate” but doing nothing. It fits a pattern of the scandal-ridden Israel police who have seen numerous senior officers investigated for sexual harassment. Abuses are not new to the police force, which is underpaid and has serious institutional problems outside of accusations of racism. In short: Israeli society does not do a good job at taking responsibility. 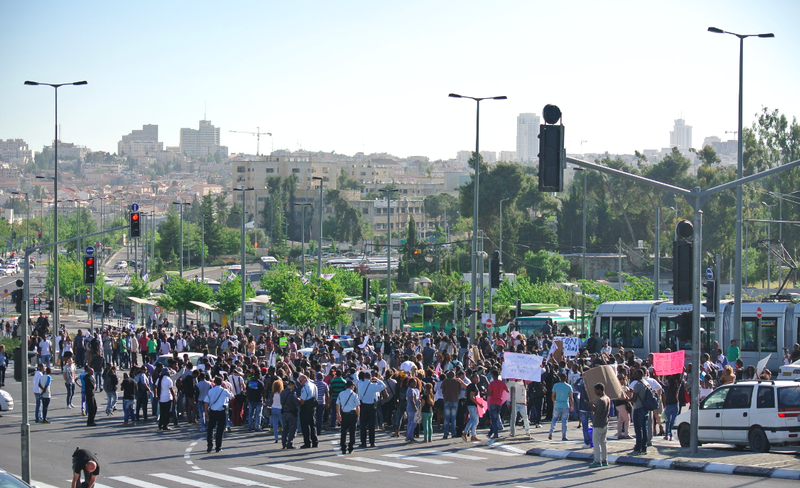 Then, as hundreds more mostly young people, holding signs against racism and some carrying Israeli flags, joined the activists they moved to block route 1, the major artery connecting Jerusalem to suburbs north of the city. They blocked the Light Rail and traffic backup for kilometers, but police did not disperse the protestors for three hours. Police commanders urged their men to show restraint. It was interesting to see the commanders ordering their men back. Although the police brought in a mounted unit of four horsemen and also a water cannon “stink truck”, it was clear they wanted this to be a “hands off” event. Israeli Jewish society has a lot of solidarity and Ethiopians serve disproportionately in the army. Around 92% of Ethiopian men are conscripted for service at 18 (compared to 75% of Jewish men in general). Many of the police and Border Police called out to deal with the protest know Ethiopians and serve with them. Unlike in America, where many drew parallels between this protest and Baltimore, there is not as much of a color divide in the country due to the nature of army conscription. An Ethiopian soldier who came from the Negev with another man from his unit felt he had to do something. “I protect the country, we don’t deserve this, we are Jews…the police who did it must receive prison time.” His friend, one of a handful of non-Ethiopians present agreed, “it’s a racist society.” Other onlookers, such as Haredim and Arabs who had gotten out of school in Sheikh Jarrah, agreed that society must confront the problem. “They did it to Moroccans, we are with you,” said a driver who, despite being stuck for an hour in traffic, felt solidarity. It is a reminder that Israeli society has often been racist to immigrants from other countries and minorities. In the aftermath of the last election there was an outpouring of rancor by the Left against Israel’s lower class neighborhoods who had voted overwhelmingly for Netanyahu and other right wing parties. “Let the Neanderthals suffer,” said one cultural figure. Other NGO leaders said that the poor didn’t deserve charity. Most of the hatred was directed at “Mizrahim” or Jews from Muslim countries. But Ethiopian Jews are also part of that poor fabric that is loathed and despised by some on the Left for “ruining” the “European” nature of Israel. None of the “anti-racism” groups participated in the protest. There were no Meretz flags, or any Labor Youth or other youth movements of the left like HaShomer HaTzair. No visible young people from the Hebrew Union Campus of Reform Judaism came, despite article claiming that they care about ‘social justice’, ‘tikkun olam’ and anti-racism agendas. At the large intersection of Levi Eshkol and Route 1, former Knesset Member Pnina Tamano-Shata gave an impromptu speech to those gathered. “Where are the Knesset members? Look at your friends, you all have a future; but the police must take responsibility.” Tamano-Shata reminded the crowd that 40% of Ethiopian men in the IDF are sent to military prison during their service. Why are the incarceration rates so disproportionately high for this group? When she was an MK she had toured the army prison system and seen the massive number of Ethiopian faces herself. She said it was related to the violence in the community by police. Ethiopians are neglected as youth, they are neglected in high school, beaten by police, suffer racial profiling and then end up in army prison. In short, the picture presented was of a generation being raised without the prospect of success. Tamano-Shata asked where the Knesset members were and it is a good point. Where were the Knesset members who claim to speak about social justice, inequality or helping the poor and downtrodden? Not one came out of 120. Not one could take the time? After Tamano-Shata’s impromptu speech on the corner of Eshkol Boulevard and Route 1 the protest seemed to be calming down. The massive crowds had become smaller moving groups of men and women. Some sat around smoking and talking. Light Rail ticket takers came to watch. The police had cleared traffic back, which was no backed up for miles, and the protesters had the run of an area stretching for a square kilometer. Then some of the protesters decided to head towards French Hill and block traffic there. “But there is nothing there,” asked others. Some stood and argued with policemen on horseback. “Beat us, you are used to beating us! We are the trash of Israeli society, no one pays attention.” But police commanders told their men not to talk back and to let the anger dissipate. The protesters were not always clear on what they wanted. “We want equality like everyone; Yemenites and Moroccans…It is racism what happens…in this country…because I am black my hand…they stop you,” said one man. Others wanted to see the police who beat the soldier be put in prison. But this wasn’t Ferguson or Baltimore. No one looted. No one burned down stores and stole from them. In the opposite, Ethiopian protesters could be seen chatting on the site sometimes with the police. It seemed that the Border Police had purposely not included Ethiopian members in the units deployed, because usually you see a lot of Ethiopians in that unit. Nevertheless some activists found friends they knew from their army service in those opposing them. Around eight at night, as dark finally began to fall, the protest that seemed to be dying down suddenly picked up again. A group of a few hundred managed to get to central Jerusalem and attempted to rush the Prime Minister’s residence. Now the careful planning of the police to avoid violence fell apart. Tear gas was fired, out came the billy-clubs and protesters were injured. Several police received injuries by rocks thrown and hot pepper thrown at them. 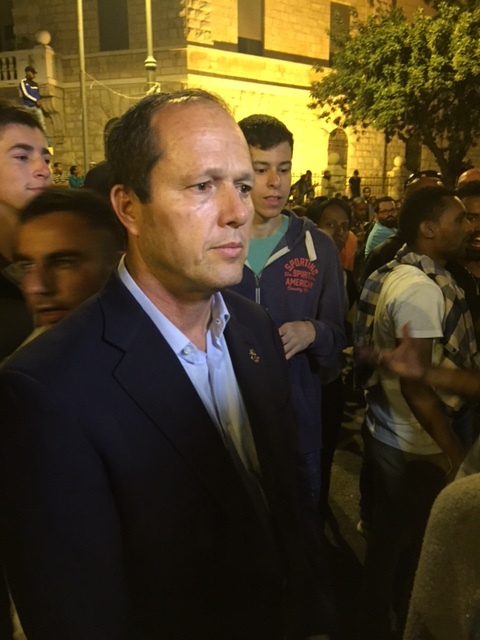 Jerusalem Mayor Nir Barkat, hearing of the violence, rushed to the scene at the corner of Keren HaYesod street and Gaza street. A small square is there with a fountain, overlooked by a hotel and a large old Catholic school. As the police restored order and former a line protecting the Prime Minister’s house, the mayor waded into the crowd of several hundred, mostly Ethiopian, activists. He then stood, with two body-guards behind him, and listened to their complaints. Often these were shouted by angry youth who said they were suffering racism and wanted accountability. “It is important for us listen to them, they are people who are very frustrated; and this is a red flag for Israel,” said Barkat. “No one cares about us, we go to the army, our blood is the same blood, but they beat us,” shouted one woman. Other complained of years of racism and feeling abandoned in society. People brought signs memorializing an Ethiopian soldier who had committed suicide after abuse in prison. A young man and woman in red from a communist movement came to show support. There were some other white faces in the crowd towards the evening, some veteran leftists from the neighborhood of Rehavia and some haredi and national-religious men. But many passer-by had no idea what it was all about. “Racism?” they asked. 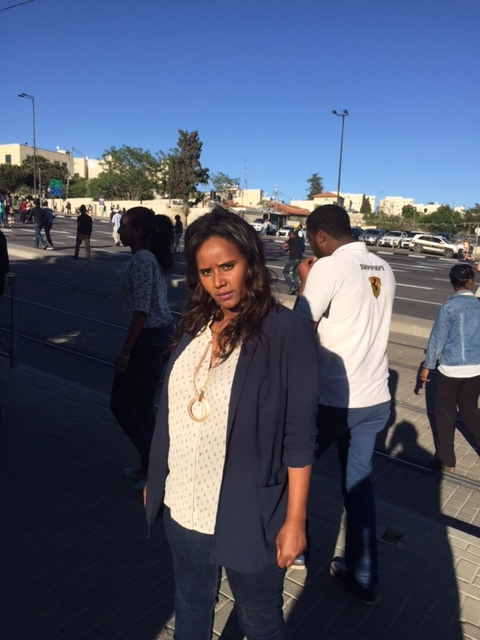 Many agreed there is racism, but they had not heard of the video and were surprised to see three hundred Ethiopians in Jerusalem chanting and shouting and blocking a main intersection near the Prime Minister’s house. Police showed restraint throughout the evening after their momentary lapse. They waited until almost eleven at night for the crowd to disperse and to get traffic moving. This was a momentous and unprecedented event in the Ethiopian community. But it was not always understood by the media. The media focused on the few minutes of violence and missed the fact that Jerusalem is not Baltimore, as evidenced by the mayor standing with the people for almost two hours. In addition Israel Prime Minister Benjamin Netanyahu mistakenly called the protestors “immigrants” when they were almost all born in Israel. Whether the police will provide new guidance and visibly punish the men who beat the soldier is unclear. The police has already been doing diversity training with Ethiopians, and some Ethiopians serve in the police. The real question is about Israeli society. 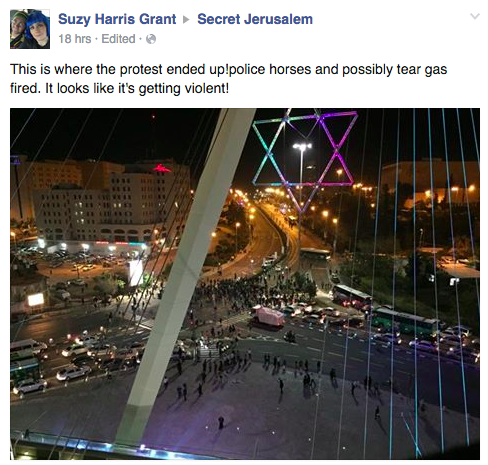 Haaretz, the favored newspaper of the elite Left didn’t even have a story about the protests as of midnight last night in its English edition, while Ynet and The Jerusalem Post did. Why did the Israeli left ignore this protest? Why did all those who are highlighted for being involved in “anti-racism” shrug their shoulders? Is it because Ethiopians are Israelis and they serve in the army and “anti-racism” in Israel tends to mean caring about asylum seekers from Africa and Palestinians? Does the victimhood of racism have a litmus test or a hierarchy? For many on the center and right the fact that the victim was a soldier angered them. But on the left, did the beating strike a cord? What will be the response of foreign Jewish communities? Interviewed on i24 this morning they discussed the response of American Jews. It remains to be seen if this protest will keep up the pressure and gain support, or be ignored, like the community has been for years. Reports noted that some protesters moved on toward the String Bridge at the entrance to the city. There they blocked part of Route 1 coming into the city around eleven in the evening. Police forces were deployed there and the protests died down. Many took buses home, some of which had been organized by activists. In the morning some signs against police brutality and racism still littered the area near the Prime Minister’s residence. What was most interesting to see was the lack of response in some places. 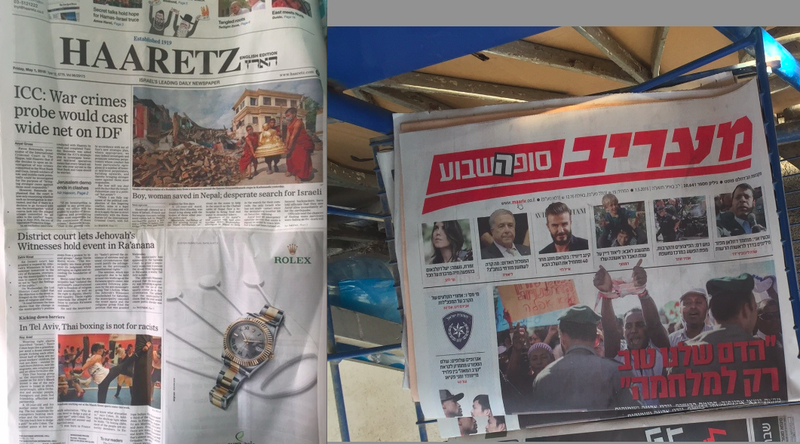 Haaretz english edition didn’t put the protest on the cover; preferring an article about “Thai boxing” and Jehovah Witnesses and the ICC instead. One imagines that if it had been a protest by 1,000 Palestinians shutting down main roads throughout Jerusalem and in front of the Prime Minister’s house it would have been a front page story. In general there was a deafening silence on the “left.” Some foreign reports spoke about “rioting” and tried to connect the protest to Baltimore or Ferguson, without mentioning that there was no looting involved.